At its core, MakeupDirector’s leading face mapping technology is the foundation of realistic virtual makeup. Facial features are precisely mapped yet can be fine-tuned with customized adjustments. Includes a massive collection of makeup colors and styles for the face, eyes, lips and more. Mix and match to create unlimited possibilities that are true-to-life. Select and save your own set of custom colors to be used for applying foundation, blush, eye liner, eye color, lip color, hair color, eyebrows and eyeliner. An improved Face Contouring tool allows you to apply different foundation patterns and manually select from a variety of dark and light tones, for a truly natural look. Comes with a library of Natural and Costume looks. Expand the library by downloading more looks from Beauty Circle. Easily change hair colors to create the complete style you envision. Review all the changes you made to each image down to the very colors and ratios you applied. A perfect way to use the same styles across different projects. 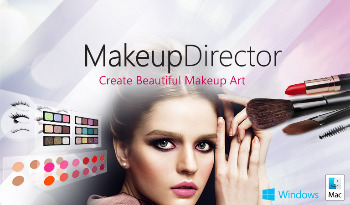 MakeupDirector is extremely easy to use. Clear representation of colors and styles that can be easily selected and fine-tuned for customized looks. Support for high resolution images, lets you work on bigger screens, tend to greater details and produce top quality makeup looks to share with clients. MakeupDirector will intelligently recognize multiple faces in your photos and automatically assign facial points respectively. You can also adjust the results manually for a perfect finish. MakeupDirector is all you need to design new looks. You can also share your looks on Beauty Circle, a community of beauty enthusiasts around the world. Give the lips an upward lift to create a subtle smile. Comes with tools to whiten teeth for the perfect smile. Get extra pounds off with easy slider to reshape faces for a slimmer look. Enlarge the eyes too for added attraction.